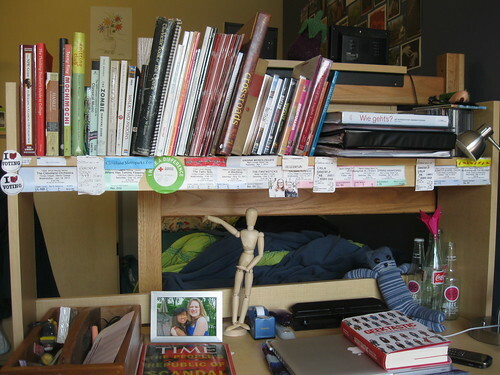 Out of every possible topic for an Oberlin admissions blogger, dorm life has to be one of the--if not the--most oft-written-about topics. Why then am I writing about my experience living in Kahn? Well, as informative as the other bloggers' posts have been, I feel like I have a few things to add from my own personal experience. In an effort to avoid repetition, I'll link to pre-existing posts where appropriate. I sleep here. You can tell that I took this during finals week because I didn't even bother to make the bed. 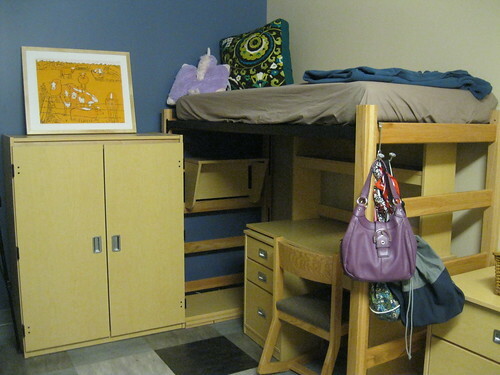 When I filled out my housing form last summer, I requested a double in an FYE dorm. Full disclosure: I have never been very good at making new friends quickly, so I figured that living around a bunch of other friendless (joking! kind of...) first-years would give me my best chance at making connections with Obies. On the housing survey, you're supposed to put your first choice (I think you are also supposed to put your second and maybe even your third choice as well, but I don't remember exactly) and I marked Kahn as mine because I'm passionate about living as sustainably as possible. When I toured campus the first time, Kahn wasn't built yet, but I was still pretty sure that it was where I wanted to live, even though I didn't know its size or location. It's worth noting that I requested a double room because I didn't want to encourage my hermit tendencies, not to mention that singles in FYE dorms are pretty scarce and that singles are more expensive than doubles. After filling out the basic housing and roommate request forms, I wrote a short essay about why I wanted to get into Kahn and proceeded to wait. After a while I found out that I would be living in Kahn with another girl. 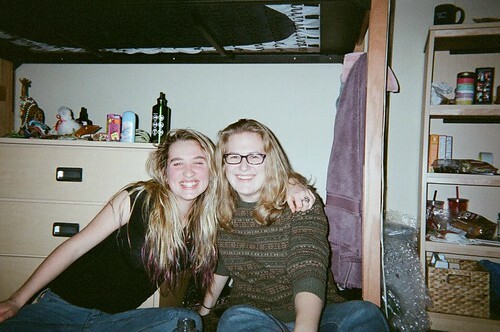 My highest hopes for my living experience were that I would become friends with my roommate and the members of my hall and that the other Kahn residents would push me to live more sustainably. These being my highest expectations, naturally not all of them were met. First off, while living in Kahn did push me to be more sustainable in some respects (shower timers to monitor my water use, recycling and compost bins for waste, reminders to turn off unnecessary light sources), I didn't really learn anything new about conserving energy and water use. That would've been acceptable to me had other people in the dorm not totally ignored some basic guidelines for sustainability. While no one that I know of violated the rule against having cars (applicants have to sign a contract that if they end up living in Kahn, they won't bring a car to campus), some people brought refrigerators or TVs despite being specifically asked not to.1 It's worth mentioning now that if you live in Kahn, you likely DO NOT NEED a refrigerator or TV. The TVs in Kahn are nicer than the one you want to bring (not hating on your TV, just saying), and watching movies together builds community anyway. When I didn't want to watch TV socially, I could just watch it on my computer. The site of most of my TV-viewing for the last year. Similarly, each hall in Kahn has three mini-fridges, which is enough for everyone. Even worse in my opinion is that so many people failed to compost and recycle correctly. On one of the last days before move out, when my stress levels were higher than normal, I almost had a fit because Kahn residents were failing to collapse their cardboard boxes before recycling them, or, worse, forgetting to remove their contents, which ranged from almost empty bags of cereal to about half of a pizza, which I kindly (or neurotically?) put in the trash bag. I think that the root of this problem is that Kahn is the nicest and newest of the freshman dorms, so everyone wants to live there, but I also think that living in the nicest dorm should come with a cost. If Kahn truly wants to be the sustainability dorm, it either needs a more comprehensive application process or, more practically, a stricter contract for students to sign, one that forbids cars, personal refrigerators, or TVs or goes even further with sustainability measures that I can't come up with on my own (like I said before, I'm not perfect). Maybe there are complications that prevent this from actually happening, but it's certainly something for the college (or at least the hall council) to consider. However, I did somehow manage to make friends, real, good friends to whom I can write stupid e-mails about the impending zombie apocalypse or talk to about actual problems in my life and still don't think I'm too weird to talk to! Sure, I floundered initially, and worried that I would leave my first year of college without a solid group of great friends, but things eventually turned around. Now I have a sold group of friends and a fair amount of people that I feel comfortable talking to about school or stupid things on the internet. I suppose that's what living in close proximity with a lot of similarly un-rooted people will do. I have friends! These are a few of them at the Big Parade. 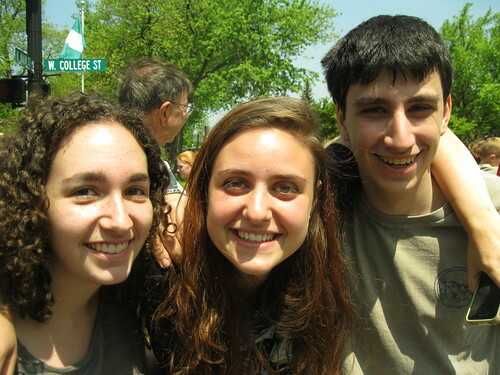 I think that Ronni, Julia, and Conor have already appeared on my blog, but I like them and I like this picture, so it stays. After she left I ended up getting around ResEd's efforts to give me a new roommate and I had a double to myself for most of the year. I loved it. My room became my sacred, alone-time space. The place where I would retreat if I wanted to be by myself for a while, study in the comfort of my bed, or just watch a lot of Vlogbrothers videos without interruption.3 As weird as it was to have another set of furniture that I wasn't using, I ended up making the space totally my own. This is where my roommate used to sleep/store her stuff. 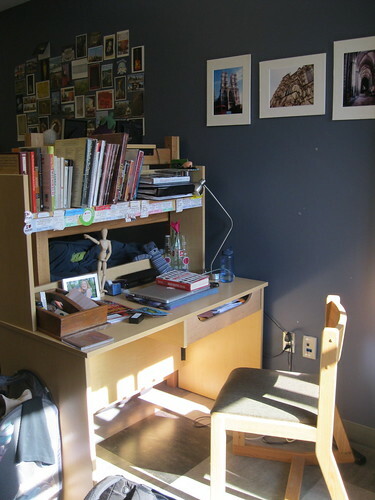 Whenever I try to study in my bed, I end up falling asleep, so I borrowed an extra bottom sheet from a friend and made the bed into a study lounge and stored my piece from the art rental (by conincidence, the same one that Ida had in the fall) on the dresser. Even though my experience living in Kahn wasn't perfect, I ended up with a pretty sweet room and, more importantly, a group of great friends. Based on my experience, I would highly recommend living in FYE to any incoming Obie who wants to make a lot of friends, especially introverted Obies. In case anyone is curious, next year I'll be living in Burton with my good friend Emma. 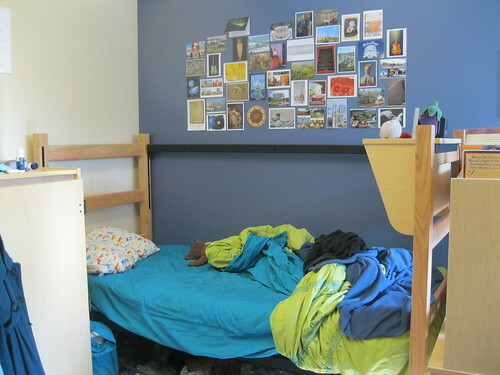 We had initially hoped to live in a quad along with our two other friends, but due to our incredibly poor housing time, there were no quads left on the Oberlin campus, so we settled on two doubles and chose partners based on living habits. Even though I would've loved to live in a quad next year, I'm super excited to spend next year living with Emma, and Emma, if you're reading this, I promise that I won't bring as much stuff to school next year! 1I suppose I can only speak from my personal experience here, but I remember my RA sending us an e-mail specifically requesting that we not bring a TV or mini-fridge. 3I am a giant squid of anger because spell-check doesn't think that Vlogbrothers is a real word! I approve of your color combos. Blue and green forever! My roommate first year went on emergency leave right after the end of fall semester and I had my room to myself for all of winter term while I packed up all her things. It was such a bizarre experience to hear that my roomie was gone (literally, overnight) but lucky for me, I ended up with another roomie for the spring semester. Shaina was a bomb-tastic roomie, and she went on to be the RA for Hark the following year.